Fishpond Ltd. is a New Zealand e-commerce company based in Auckland, New Zealand. Fishpond is part of a larger business called WorldFront. . It was one of the first major companies to sell books over the Internet in New Zealand. Founded by Daniel Robertson in 2004, Fishpond.co.nz is a full-scale online bookstore. It also sells DVDs, music CD, Toys, Household Goods, Cosmetics, and Electronics. In mid 2013, it had nearly 13 million items in its catalogue, and made 20,000 sales per day. By 2018, Fishpond's catalogue had increased to over 25 million items, and was selling a product every 1.2 seconds. The company is headquartered in Auckland, New Zealand with staff located across Auckland, Christchurch, Melbourne and Perth. It maintains software development centers in Auckland and Christchurch. ^ Stock, Rob (23 June 2013). "Fishpond baits its hook with more picks". Fairfax New Zealand. The Warehouse Group officially stylized as TWG, was founded by Stephen Tindall in 1982, and is the largest retail group operating in New Zealand. The Warehouse Group (TWG) is a group that consists of The Warehouse, Warehouse Stationery, Noel Leeming and Torpedo7 Group. TelstraClear Limited was New Zealand's third-largest telecommunications company before being acquired by Vodafone New Zealand in October 2012. Trade Me is the largest internet auction website operating in New Zealand. 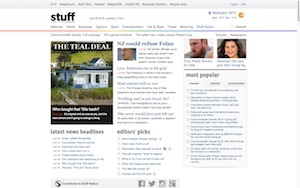 Managed by Trade Me Ltd., the site was founded in 1999 by New Zealand entrepreneur Sam Morgan, who sold it to Fairfax in 2006 for NZ$700 million. Trade Me was publicly listed as a separate entity on 13 December 2011 under the ticker "TME". Trade Me Ltd also operates several sister websites including FindSomeone, Travelbug, Holiday Houses and LifeDirect. Orcon Limited is a New Zealand telecommunications company. It is New Zealand's fourth largest Internet service provider (ISP). In 2013 it had a 5% share of the fixed line market. NZ Bus, formerly Stagecoach New Zealand, is New Zealand's largest bus company, operating in Auckland and Wellington. It is a subsidiary of Infratil. As of 24 December 2018, Infratil is selling NZ Bus to Australian equity firm Next Capital, subject to a consenting process. Rhema Media is a Christian media organisation in New Zealand. It owns radio networks Rhema, Life FM and Star, and television station Shine TV. It also publishes Bob Gass's quarterly devotional publication The Word For Today, and a youth version called The Word For You Today. Rhema Media is based in Newton, Auckland and is the founding organisation of United Christian Broadcasters (UCB). Christchurch Casino is a casino located in Christchurch, New Zealand offering casino games. The 43,998 sq ft (4,087.5 m2) casino was New Zealand's first when it opened in 1994. The casino operates five hundred slot machines and thirty-four table games. The property has three restaurants and two bars. Entry is restricted to patrons above the age of 20. Ports of Auckland Limited (POAL), the successor to the Auckland Harbour Board, is the Auckland Council-owned company administering Auckland's commercial freight and cruise ship harbour facilities. As the company operates all of the associated facilities in the Greater Auckland area, this article is about both the current company and the ports of Auckland themselves. MediaWorks New Zealand is a New Zealand-based television, radio and interactive media company entirely owned by Oaktree Capital Management. It operates playout services from Auckland and Wellington studios via Kordia's microwave network for Newshub, Three, and Bravo, ten national radio brands, eighteen websites and three locally operated radio stations. 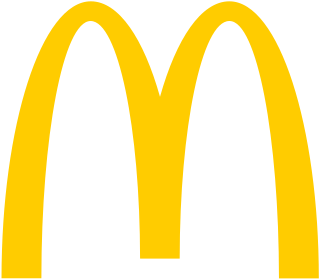 McDonald's Restaurants Limited is the New Zealand subsidiary of the international fast food restaurant chain McDonald's. Its first location opened in 1976. McDonald's New Zealand currently has over 160 restaurants operating nationwide, serving an estimated one million people each week. JUCY is a tourism company which was founded in New Zealand. JUCY is primarily a car and campervan hire business and also operates scenic cruises in Milford Sound and Snoozes in Auckland central, Queenstown, and Christchurch New Zealand. Kiwi Property Group Limited is a New Zealand NZX-listed company, formerly a real estate investment trust, that owns many properties throughout New Zealand; including the Sylvia Park Business and Shopping Centre, and the Vero Centre. It is also New Zealand's largest-listed property fund.